Home » Aromatherapy » Best Way to Diffuse Essential Oil on the go! Have you heard of Essential Oil Jewelry? Essential oil jewelry can come in the form of bracelets, necklaces, earrings, and charms. Allowing you to diffuse your essential oils all day on the go. Who doesn’t love the way their home smells when they add a few drops of their favorite oil and diffuse away. I stay away from toxic air fresheners and scented plugins and instead opt for a clean natural smell that can also calm, balance, and restore! I wanted to be able to enjoy the same luxury I do at home on the go, that’s when I found Essential charms essential oil jewelry. Due to sensitivities I can not wear regular perfume. Something about every perfume I buy gives me awful side effects like headaches and sometimes nausea. This is when I started wearing essential oils as perfume. 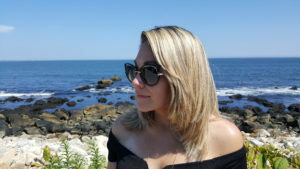 Normally I would mix just a few drops of my favorite oil with some jojoba oil and rub it on my wrist but discovering essential oil jewelry has made this an even better option because……. Another one of the great reasons I would recommend wearing essential oil jewelry is because it can be safer for mommy and baby. Many essential oils are just fine when diffused but cannot be applied topically while pregnant. My essential oil bracelet and necklace make it so I can still enjoy my favorite oils and scents without worrying about it affecting my baby. You’ll want to make sure you do some research. There are a list of no no oils when pregnant. Some oils can induce labor or miscarriage so you’ll want to be sure you are choosing oils that are safe for both you and baby. Essential oils have been used for centuries for their therapeutic and healing benefits. Each Essential oil has a different scent and therapeutic effect. If you want to learn more about using essential oils check out my Guide to oils here. Lavender for example is one of my favorite essential oils. I love it for its versatility and it is also generally regarded as safe in pregnancy and with children. Lavender is most commonly known for its relaxing benefits and its effects on skin and the body. It can be used to cleanse cuts, bruises, and soothe skin irritations. The fragrance is sweet and flowery and produces a calming, relaxing, and balancing sensation. In order to use your Lavender Essential Oil on your Essential Charms Bracelet, Simply apply 1-2 drops to your lava bead and let them dry for 5 minutes. The porous nature of the lava rock will absorb the oil and allow you to wear the oil without it transferring to other materials like your clothes. The use of the lava bead replaces the need to dilute your oil or mix it with a carrier oil such a jojoba, coconut, or almond oil. The best part is you’ll save $ on oil because the scent will last anywhere from 2-5 days depending on your oils potency, and some scents last longer than others. My NYR Organics Lavender oil lasts around 4-5 days and you can simply refresh your lava beads at any time by adding another 1-2 drops. If you want to enjoy another scent you can simply rinse your lava beads in warm soapy water and let them dry. Then follow the instruction above to add another oil to enjoy! The Whole line of Essential Charms Jewelry is exceptionally crafted to provide you with high quality oil jewelry. The necklaces contain handcrafted lockets that are both nickel and lead free. They are then plated in either silver or gold depending on the look you desire. The bracelets are made of premium stones, and contain 3 (12 mm) Natural Lava Stones , and a custom stainless steel cube with oil droplet emblem. They come in a variety of colors and sizes, all of which have different meanings. I personally love that they have different sizes as my wrist is very small and most jewelry will fall right off. 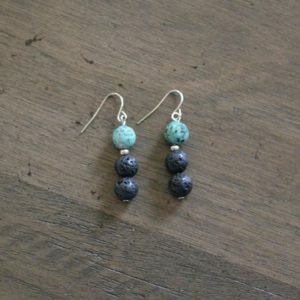 They also have earrings which I have never seen and their lava stones are 100% natural and ethically sourced from floes in the pacific ocean, also known as the “circum-pacific belt”. 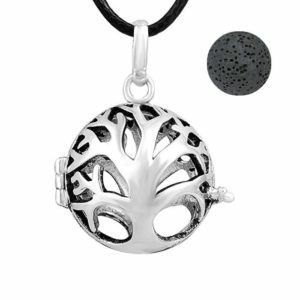 This tree of Life Charm Necklace is not just my favorite but everyone's favorite. The tree of life displays Nature's ability to heal and bring balance to the body and spirit. This lead and knuckle free charm is silver plated and finished with a clear coat to protect against scratches. Simply choose between 5 Lava stones, Black, Turquoise, Red, Purple, and Beige, the Black is pictured above! 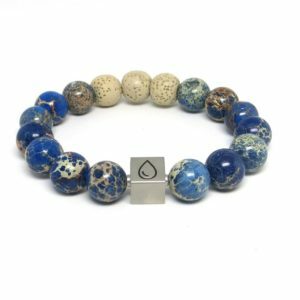 This is the beautiful "Deep Blue" lava bracelet which is handmade with premium, semi-precious 12mm Blue Magnesite stones, 3 beige lava stones and a custom stainless steel cube. Used in relaxation exercises, Magnestite brings a deep peace and sense of understanding. It is a calming and relaxing stone that is said to stimulate "heart felt" love as it is often used to open the Heart Chakra in Yoga and mediation practices. Magnesite contains a high level of magnesium and aids with absorption in the body which makes it a perfect pairing for Essential Oil jewelry. I love the earthy combination from the beige lava stones paired with the cool blue ocean hues. Each stone is different but complements each other beautifully. This Bracelet comes in 2 different sizes. 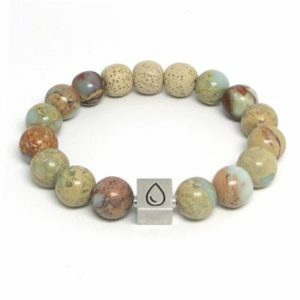 The "Good Impressions" lava stone bracelet is handmade with premium, semi-precious 12mm Aqua Terra Jasper stones, 3 beige lava stones and a custom stainless steel cube. This is my everyday go to bracelet as you can pair it with almost anything! "African Turquoise" is perfect for use in essential oil diffuser jewelry. It's not actual turquoise, but rather it's own unique stone; a speckled form of Jasper. Known as an evolution stone, it is used by cultures to bring forward change and transformation within ones life. Paired with two, 10mm lava stones it makes a bold statement and is perfect for diffusing essential oils to increase health, reduce stress or let go of unwanted fears and desires. To diffuse your favorite essential oils, place a drop or two directly on the lava stone and allow to dry for several minutes.